Books illustrated by Penny Meakin and signed by the artist on request. To purchase please contact the artist. Prices for books include postage within RSA. Overseas mailing rates will be quoted on request. Click on the thumbnail to see a larger image and for more information. 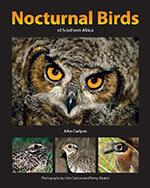 "Nocturnal Birds of Southern Africa" A richly illustrated book on the elusive nocturnal birds of southern Africa. Features almost 400 high-quality photographs and illustrations. Written and produced by John Carlyon, and illustrated by Penny Meakin. Signed by the artist and the author on request. For further information please go to the author's website. R280 plus p&p.